July 2017 | It`s full of stars! 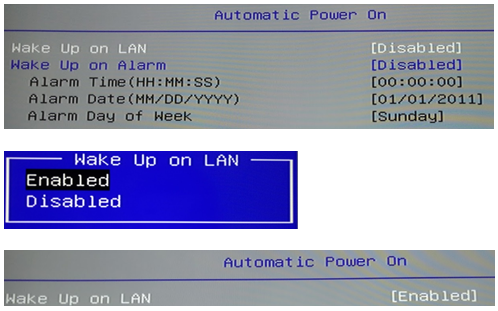 To be able to wake up your computer via wake-up-on-lan (WOL), you need to enable this feature in the BIOS and in the Windows 10 LAN adaptor settings. Configuration depends on the BIOS of your computer. In my case, wake up on LAN is in the power on section and disabled by default. To use this feature, just enable it. Do not forget to save the change. After activating WOL in the BIOS, you need to configure Windows 10 to allow the device to wake Windows. My test computer is a Lenovo Q180 running Windows 10 German. More information on how to activate WOL for this device can be found here. Go to Network and adaptor properties. Select the LAN adaptor and open its properties. In the property screen, select Configuration. Go the Entergy settings. Check all check boxes. Now go to the next tab: Advanced. 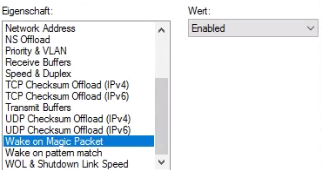 Ensure that Wake on Magic Packet is set to Enabled. To know that a computer is running, you can use ping. If the computer responses to a ping, it’s up and running. To allow ping requests through the standard Windows firewall, ensure that the rule for file and print service is activated for your network. There are two network types: private and public. Activating ping for the private network should be sufficient. If you are unsure if your LAN is part of private or public, you can activate ping requests for both. At least, when your network is still secured by a router with firewall.